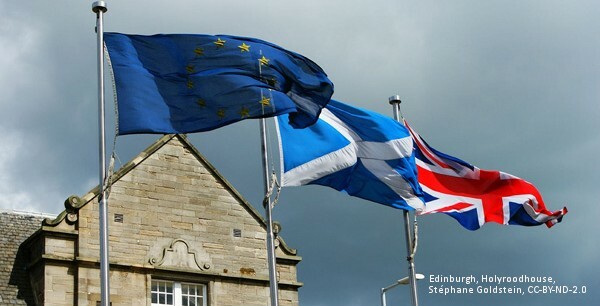 Image Attribute: EU, UK and Scottish Flag at Edinburgh, Holyroodhouse. Photo by Stéphane Goldstein, CC-BY-ND-2.0. One fact not commonly understood in Scotland and the UK is the unique nature of Scottish devolution. Among the 60+ European Regions with Legislative Power (REGLEG), Scotland has a unique settlement in that the areas of powers of the Scottish Parliament have been devolved in full, by the Scotland Act 1998 and subsequent acts in 2012 and 2016 (the latest following the 2014 independence referendum). This division is consistent with UK constitutional tradition – indeed, the Acts of Union of 1707 already provided for certain separate jurisdictions for Scotland, even if there was to be only one parliament for the UK. However, it stands in sharp contrast with most other autonomous, regional or federal sub-state polities in Europe, which share most of their powers with the central government and parliament. This gives the central level the final say in most substantive policy areas, be that the decentralized administration in Germany or the Ley de bases in Spain. As a result of this very British (Scottish) exception, in the almost two decades of devolution, there has been little need for proper or legally-framed mechanisms for intergovernmental and interparliamentary coordination. The Joint Ministerial Committee and the informal, mainly ad hoc coordination between civil servants and parliamentary clerks appeared to suffice. The fact that both share a unified UK civil service and a consistent political culture eased any major discrepancies. These relations are contrasted with the high levels of litigation (positive conflicts of competence, to use the standard definition in comparative constitutional law) that have plagued intergovernmental relations within other European states. Spain is a case in point, with significant numbers of cases reaching the Spanish Constitutional Court. Indeed, a root cause of the current Catalan crisis, missed by most international observers, is precisely the legal and political conflict over notions of competence over the past 40 years. In the first 14 years after autonomy was restored to Catalonia, the Basque Country and Galicia (rough equivalents, in terms of devolution, to Scotland, Northern Ireland, and Wales), no less than 211 cases concerning conflicts over competence between the central and autonomous governments were decided by the Spanish Constitutional Court. There is a clear risk that increasing levels of litigation on devolution could now reach the UK Supreme Court – which has been fairly silent on matters of devolution, due to the absence of conflict – as a result of disagreements over returned EU competences after Brexit. Brexit changes the aforementioned harmonious picture of UK multilevel relations. For the first time, the neat division of powers in the Scotland Act has been complicated by the powers to be returned from the European Union. What appeared to be a clear-cut division of powers domestically was in reality made simpler by powers being shared with the EU. The European Union (Withdrawal) Act 2018, as a bill, originally presumed that most EU-related powers in devolved areas would remain in Westminster, later to be decided whether they should be passed on or not. It took the same approach on enforcing the law, reporting requirements and any new agencies that might be created. Quite unsurprisingly, both the Scottish and Welsh Governments issued alternative amendments in September 2017 that would in effect create, if not a federal, then a multilevel consociative (to use Lijphart’s term) arrangement for UK policymaking. That would have meant that that UK ministers would be required to obtain the consent, rather than simply consult, their devolved counterparts. Equally unsurprisingly, the main UK Westminster parties resisted this alternative in a telling example of UK reluctance to adapt devolution, even with the stress that Brexit will cause to the UK’s constitutional architecture. This confrontation resulted in an increasing contest of legitimacy, as the Welsh and Scottish legislatures hastily discussed and passed their own respective EU Continuity Bills by 21 March, in spite of UK Cabinet Office Minister David Lidington’s proposals in February to change the bill’s approach and presume that (most) returned EU powers should be devolved by default. This was understood as a safeguard in case of an agreement during the passage of the bill. The tension increased when the UK Government opted on 27 April to challenge the Scottish and Welsh continuity legislation before the UK Supreme Court. The dialogue continued and on 24 May the Welsh Government accepted the amendments tabled by UK Brexit Minister Lord Callanan the day after (the last date possible), on the basis of David Lidington’s earlier offer that all but a minority of returned EU powers would be devolved by default. Scottish Brexit Minister Michael Russell and, in a public letter to the Prime Minister, First Minister Nicola Sturgeon rejected this compromise offer, on the basis that the amendment to Clause 11, Section 3 of the bill introduces a consent decision that is merely procedural. It simply states that the UK Government should not decide on a returned power before the Scottish Parliament is given 40 days to respond. This is not a veto, just a consultation – which is why the Scottish Government stood firm with its original proposals for a right to decide. The UK Government based its position on the UK Supreme Court’s Miller ruling of last year which stated that, despite what is commonly and politically understood, the UK is not a union but a unitary state in which Westminster has absolute sovereignty, including in EU/foreign and devolved issues. Nicola Sturgeon replied with a caustic op-ed in the Sunday Herald, expressing her worry that Brexit will undermine devolution, as it is currently understood, in an unprecedented way. Indeed as the Spanish – or, for that matter, German, Canadian or US – experiences show, with shared powers, the odds are stacked against subnational polities. Evolving political mores also play a part. The Scottish Conservatives’ 2017 General Election manifesto announced the end of a ‘devolve and forget’ model of devolution, which could be a harbinger of a central government more keen to be seen on the ground in Scotland and Wales than was the case during the Blair, Brown, and Cameron eras. Recent developments including a brief spat between the UK and Scottish Governments over their respective roles in broadband expansion in Scotland, the City Deals, the forthcoming UK Shared Prosperity Fund and a more activist Scotland Office (now rebranded as the ‘UK Government, Scotland’). These follow the example of the Spanish and Austrian Governments, offering an alternative channel of government and redress to the devolved one. In time, this can result in the multilevel triangulation that is common in most federal polities. Civil society, local government, and other actors shop around for the support of either regional or state governments, particularly if these are at loggerheads with each other. Looking at the international precedent, these efforts could clearly dampen the standing of Holyrood and St Andrew’s House in public opinion as of the main port of call to engage with government. However, this need not be the case and there are promising signs of the contrary. The Joint Ministerial Communiqué of 16 October 2017 provided the first hint in many months of moving towards post-Brexit ‘common frameworks’ – a combination of legal, political, aspirational and practical criteria for action in former EU areas. These simple principles apply to these common frameworks (a decidedly non-legal term) in areas (as opposed to legal competence) where EU law currently intersects (as opposed to concerns) devolved competence – and establish UK Government-devolved administration working arrangements to deal with reserved and excepted matters that impact significantly on devolved responsibilities. These principles are a prime example of British pragmatism, as their non-legalistic simplicity shows optimism by civil servants that reasonable arguments can be crafted incrementally without the strictures of a written constitution as found in other countries. Indeed, such aspirations mix legal principles with practice and intentions. Like the Withdrawal Act, the ‘common frameworks’ do not set out any particular method of distributing these powers or adjudicating where necessary in undoing the consequences of the European Communities Act 1972. However, the UK has changed significantly since 1972, not least because of the policy divergences brought about by devolution (particularly in Scotland, which has developed a number of distinct and often ambitious policies compared to the rest of the UK/England) and diverging political culture across the UK, something emphasised by the 2014 independence and 2016 EU referendums. Ironically a key principle of the EU treaties, subsidiarity, would have been useful as a method of distributing shared EU powers. Instead, all (civil servants) hope that a sense of fairness will prevail and both the UK and devolved administrations will reach informal agreements. A great abundance of research, including work from the Institute for Government, Scottish Centre on European Relations, Local Government Information Unit, UK in a Changing Europe and the House of Lords, has underlined the need for more inclusive approaches. Indeed the Commons report in the wake of the 2014 independence referendum on intergovernmental relations in the United Kingdom made the case for a more inclusive, consociative approach in developing common UK-wide policies. Predictably, the UK Government in its reply to the report was flatly opposed to the idea. One reason was to respect the UK constitution – however, the Withdrawal Act and proposals around it would rewrite the UK constitution, as Vernon Bogdanor has highlighted. It is ironic that the only part of the constitution that is not being changed is Westminster itself. The SNP attempted unsuccessfully to change the constitutional process for EU and international policymaking through the Smith Commission. More recently, with Brexit, the Welsh Government has called for the creation of a UK Council of Ministers. As COSLA’s various submissions have shown, there are tried and tested alternative models – the Italian and Austrian cases being perhaps the most promising, as they are constructive, incremental and mainly non-political. However, we are at most likely to see post-Brexit the recreation of some joint regulatory bodies, sponsored jointly by a UK ministry and the devolved administrations, that already exist and have a clear transboundary dimension, such as in agriculture, industry or the environment. Others post-Brexit returned EU policies will conform to the traditional Westminster model. For example, the UK Government has already announced that the Competition and Markets Authority (CMA) will have oversight responsibility for state aid. Irrespective of the regulatory independence of the CMA, this can easily be perceived as Whitehall acting as both litigant and jury on state aid issues. This incrementalism in developing common frameworks and new policy structures will make UK governance even more piecemeal and unsystematic. Local government has so far largely stayed out of the Brexit and EU powers discussion. Following the Scottish-Welsh proposal last September of 111 powers to be returned from the EU related to devolved competence, the UK Government published its own list of 153 ‘areas’ (again, a combination of competences, legislation, policy frameworks, and discretionary funds) affected by Brexit. In any case, the briefest of assessments of these lists suggests that at least 64 of those areas cut across not only the UK and Scottish Government powers, but also local government powers. In reality, only some of those areas – such as public procurement or the environment – will have a high impact on local government. Nevertheless, ongoing assessments suggest that the intergovernmental dynamics between the UK Government, Scottish Government, and Scottish local authorities will become much more complex post-Brexit than they have ever been in Scotland (Wales has always been more closely linked to Whitehall). Indeed, the UK-EU negotiation points agreed so far indicate that the UK will need to at very least continue to shadow EU state aid, procurement, and environmental rules – all of which directly relate to local government. Following the failure to include an amendment on local government consultation in the Withdrawal Act last December, the UK Government indicated its intention to find another way forward. It confirmed its goal of a flexible, non-statutory mechanism that, in essence, replicates the kind of engagement local government has on EU policy through the Committee of the Regions, but in a lighter-touch arrangement. While the terms of this engagement have yet to be made public, it is clear that it would not cover post-Brexit international trade discussions (a sensitive area for local government, given public opposition to CETA and TTIP, for example). It is also a sign of the prevalence of the path dependency (and elite capture) models in multilevel politics in the UK that the Committee of the Regions may serve as a template for such engagement, rather than the existing UK instrument that was set up precisely to deal with EU issues concerning local government: the UK Government’s EU Policy Statement to Part 2 of the Localism Act 2011. Even so, this decision was hailed as a breakthrough by the various local government associations in the UK. How meaningful this mechanism would remain to be seen. One thing is clear – the days of a neat division of powers between the UK, Scottish and local government are gone. Brexit will paradoxically make these multilevel dynamics very much like those of the regionalized states in the EU27. Following the Scottish Parliament’s vote refusing to give its legislative consent to the Withdrawal Bill on 15 May, and the drama of the Lords amendment stage, the UK Government’s final amendment concerning Clause 11 and the Westminster-Cardiff Bay deal passed the House of Commons on 12 June. This followed only 15 minutes of discussion, without any Scottish MPs speaking – though this does not include the many hours spent in both UK chambers discussing Brexit and devolution. The SNP Westminster group’s walkout from Prime Minister’s Questions on 13 June in protest sets the scene for the next battle. It looks likely that, as in Spain, Germany, Canada or the US, devolution in the UK will become a political question that ends up being be settled by judges. The UK Supreme Court will begin its hearings on the Scottish EU Continuity Bill on 24 July. Its eventual ruling will be a historic test not only for devolution but more fundamentally on whether the UK is a union (as much of the public believes) or a unitary state (as the court stated in Miller) – and its consequences will be wide-reaching. Dr. Serafin Pazos-Vidal recently completed his doctorate on subsidiarity and EU multilevel governance at the Universidad Nacional de Educación a Distancia (UNED). His converted thesis will be published by Routledge in early 2019. He is also the Head of Brussels Office of the Convention of Scottish Local Authorities (COSLA). This article is reprinted IndraStra under the Creative Commons (Attribution-NonCommercial-NoDerivatives 4.0 International) License provided by the original publisher - European Futures. DISCLAIMER: Please note that this article represents the view of the author(s) alone and not European Futures, the Edinburgh Europa Institute, University of Edinburgh nor the IndraStra Global.